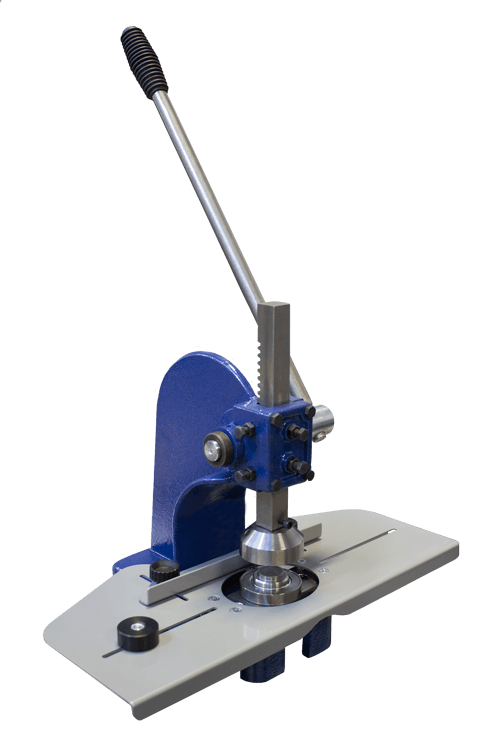 The HP1000c has now been discontinued and replaced by the new and improved HPXc Curtain Eyelet Press. Sets eyelets up to 66mm hole diameter. Easy tool change for different eyelet sizes. Adjustable stops to position material. Adjustable handle position for comfort. Soft rubber grip on lever arm. Specifically designed to insert our large curtain eyelet range (upto 66mm hole size). Hanolex curtain eyelets up to 40mm hole diameter can be fitted using our unique combination dies that unify the cutting and attaching process and dramatically speed up the whole fitting process. Separate hole cutters and setting tools are available for eyelets upto 66mm hole size or for special or demanding materials (*see notes below). The manual hand operated machine features a large robust work area and allows the user to set the eyelet position from the top of the curtain and the distance between each eyelet, making the whole process simple. It can be mounted to any suitable sturdy workbench or we can supply a robust self-assembly bench, or our new mobile bench allows you to easily move the machine around your work area in between jobs. *Separate dies are required for each eyelet size and type 40mm Square eyelets, 50mm & 66mm require separate hole cutter and setting dies. Certain silks, voiles and heavy-duty blackout materials are best fitted using separate cutter and closing tools, please contact us for more details.